Layflat Air provides an alternative from heavy, bulky conventional air hoses. 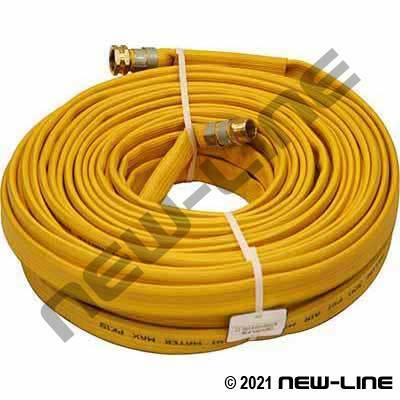 It is an extremely light and compact hose that is easily coiled and stored when not in use. Due to its relatively thin wall construction, this hose is not recommended in very rugged applications, but it does have surprisingly good puncture and scuff resistance. Its nitrile composition also provides resistance to heat, oil, diesel, grease, acids, sewage, and salts. The ribbed cover reduces dragging friction to prolong life. NOTE: Take caution when running this hose at high pressure or with excessive end pull as it may result in coupling retention issues. Use a traditional rubber hose for higher temperatures directly off compressor outlet. Typical Fittings: Universals with very defined/machined barbs for grip (ie. N32D-), ground joints (STEM-FEMALE,CAST) (CLAMP-4BOLT-DIX interlocking bolt clamps are NOT suitable due to wall thickness), N176 Hex Hose Barbs, N305/310 Long Shanks (WATER use only), triple Band-it straps, WC-SS crimp sleeves on small ID sizes (crimp sleeves are not recommended on large bore heavy duty air hoses such as 1-1/4" to 4" due to the tough cover and wall thickness). Whipcheck Safety Cables are mandatory on heavy duty air hoses for safety reasons. Construction: Yellow nitrile rubber with an embedded woven high-tensile polyester reinforcement.